TIFF Image Printer 8.0 creates high quality TIFF images from any Windows program on 32 bit and 64 bit editions of Microsoft(r) Windows 7, Windows 2008 R2, Windows 2008, Windows Vista, Windows 2003, Windows XP and Windows 2000. Control file size and image quality: Use the resolutions to control the size and the quality of your TIFF image. A higher resolution (up to a maximum of 1200 DPI) will increase the image quality and size, while a lower resolution (to a minimum of 50 DPI) will decrease the image quality and size. Create FAX ready TIFF: Profile S, Profile F and Profile C fax formats, use any fax resolution combined with the page scaling and alignment options and you have all the options you need to meet the requirements of your fax provider or to create your own fax service. Wide range of TIFF format and compression options: Use the format and compression options to create the exact format of TIFF image you need. 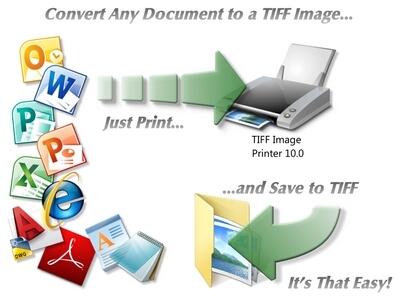 With support for legacy TIFF formats, and a wide range of compression options, you can create virtually any TIFF image required by your archival, fax or proprietary system. Automatic Color Options: Automatically reduce your document image to the fewest number of colors possible without affecting image quality. Easily change this option if you need true color, grayscale or monochrome images. Image processing: rotate, crop, trim margins, and copy your images all in a single step. Resample the image to a particular resolution, pixel size or scale it to a percentage of the original size. Workflow Integration and Automation: TIFF printer offers both the traditional programming options of prior releases but now offers a COM interface to make integration a breeze. The COM interface does all the hard work for you.